Ah, plastic. Marine biologists will never cease in lamenting plastic's negative effects on the environment and marine life. However, sometimes plastic's effects have a way of showing themselves in much bigger ways than others. While plastic debris drifting through our oceans is 'out of sight, out of mind' for most people, some of it tends to show up in more alarming ways than usual. An article released last week in the Marine Pollution Bulletin is a case study of one stranded sperm whale (Physeter macrocephalus) in the Mediterranean Sea. However, this wasn't any usual whale stranding. The whale - over 32 feet long and nearly 10,000 pounds (very skinny for a sperm whale, in fact) was found to have fatally ingested 17 kg (more than 37 pounds) of plastic debris. So what did the whale eat? Most of what blocked the animal's stomach was thick plastic sheeting used in greenhouse construction, which could be traced back to a specific produce company that grows vegetables sold in Great Britain. The greenhouses that the waste originated from produce more than 2.4 metric tons (2.6 tons) of waste PER hectare PER year- meaning 47,000 tons annually. Because the greenhouses are right on the ocean, much of the plastic waste washes into the sea, or nearby rivers. Scientists say that the stomach ruptured from plastic ingestion, secondary to being extremely underweight and starved. The excrutiating death of this animal could have been caused by directly eating the plastic, or perhaps ingesting it second hand when feeding on squid- it's primary food source. This event is a sobering reminder of the much larger problem that marine debris presents for ocean health, as well as wildlife conservation. 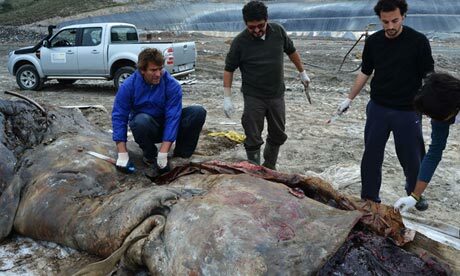 There are currently only about 1,000 sperm whales remaining in the Mediterranean Sea. There are about 200,000 worldwide. The 'visible' stranding of this individual is likely a very small proportion of the actual mortalities experienced by animals due to marine debris. Most animals are much smaller and go unnoticed, or simply do not wash ashore.